Printing your logo on a promotional bag is certainly a great way to increase your brand’s exposure and get noticed, but creating a custom bag takes things to the next level. Customizing a bag that best showcases your branding message and connects with your customers will create a lasting impression as well as brand recognition. Coming up with a concept for your custom reusable bag is the fun part. Think about the colors, material, style and size that best fits your brand. Pick ink colors and your company’s logo or a specific branding message to be emblazoned on the bag. Consider how your clients will use the bag and tailor the design to best fit their needs. For instance, do you want a bag that can be used to carry groceries home from the store or a shoulder bag that is great for toting work home from the office, or how about a gym bag? Add pockets or zippers or customize the handle length to make something that is one of a kind. Take the time to think about what your customers would like and our design department can help you create it. We have a stellar team of folks who can work with you to finalize a reusable bag design that best suits your brand that your customers will want to get their hands on to spread your message all over town. Once you decide upon the design, we can get to work creating your promotional bags at our overseas facility. 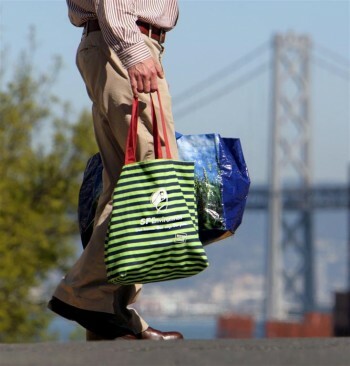 We can quickly turn around custom orders so you can have your reusable bags in no time. You can also rest easy since all of the items we produce go through a rigorous inspection so every bag you receive will be just what you ordered. Once you receive your custom bags it is time to start getting them in the hands of your customers and getting your brand noticed. Whether you give the bags out as gifts, offer them at industry events, or sell them in your store or on your website, the sooner you get the bags in your customer’s hands the sooner they can start promoting your brand and increasing your brand’s recognition. A quality, unique, well-made custom bag is sure to become a favorite and your clients will use the bag again and again. Each time your custom reusable bags are used, your brand will be put on display and prospective clients will be exposed to your branding message. It’s Fun and It Works! Get Started Today! Creating your brand’s custom reusable bag is actually a lot of fun and is a fantastic way to help build a brand. The team at Factory Direct Promos has helped so many clients big and small and we will help you to make the process seamless. You can run through the process and see the different options on our website to create your brand’s custom bag step-by-step guide. If you have questions, want to bounce some ideas around or are ready to get a quote, just let us know and a member of our team will be more than happy to help you out! The sooner you get started, the sooner you can get your custom promotional bags created and the sooner your customers can start doing the work of promoting your brand for you. Previous Previous post: How Does Delhi Plan to Make Failed 2009 Bag Ban Law a Success?